Plant description: GNS has recently implemented a novel ammonia recovery unit at the AD plant BENAS, located near Bremen. BENAS yearly treats more than 80 000 ton of food waste and poultry manure and produced bio gas, mineral N, calcium-carbonate and organic soil fertilisers. Poultry manure is very rich in nitrogen and GNS has developed a new and novel approach for ammonia recovery without the use of acids. In this approach, ammonia and carbon dioxide are brought into contact with gypsum to form ammonium sulphate and calcium carbonate. Both recovered products are valuable mineral sources for the agricultural sector. GNS has a long experience in testing these products in field trials. Besides GNS has several pilot scale test installations running for testing new NRR technologies. These include a test facility for P extraction and recovery and a test facility for recovery of lignocellulose fibres from bio waste (TRL5) to be used for the production of cardboard. Innovation: GNS will optimise and demonstrate its novel ammonia recovery unit (TRL 8) and will provide technical and economic data on the performance of the full-scale and pilot scale NRR technologies. GNS, being a true innovator, will share experiences and lessons-learned on the up scaling of NRR technologies and the vaporisation of recovered products. 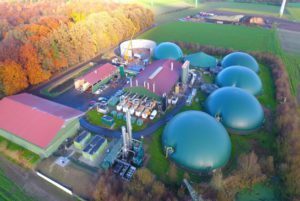 Products & Benefits: A new sustainable technology for nitrogen recovery from bio-waste without using chemicals.